Most people have heard of the four basic elements in mythology: earth, air, fire, and water. Many people may have even heard of mythological creatures that are able to use their elements to their own benefit or protection. A mythological creature that is control, more or less, of one of these four elements is called an Elemental. There are four main Elementals, one to go with each element. These four symbolic Elementals include gnomes for earth, sylph for air, undines for water, and salamanders for fire. Of course there are other mythological creatures that can use the elements to their advantage, but these are the main four. This article will describe these four creatures, and some of their symbolic meanings. It may seem silly that out of all creatures that have some hold on the earth that gnomes would be the Elemental for the earth element. Some legends say that it is the gnomes job to take care of the earth and to make sure that the earth stays standing. Because of these reasons, the gnome is often seen as a great symbol for stability and power. If something needs to protect and hold up the earth, then it has to be stable. Or else things just aren’t going to work out well for anyone. 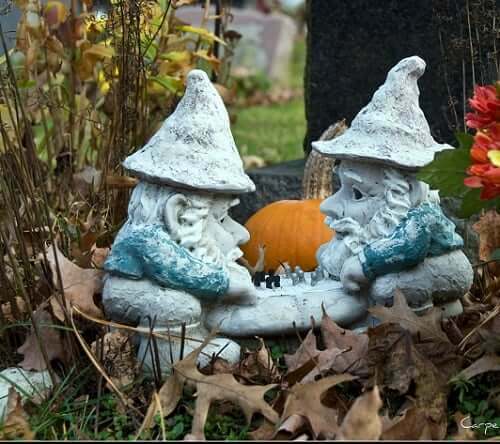 Gnomes are also said to be very protective of the earth, and because of this they are also a great symbol for protectiveness. Of course, gnomes aren’t perfect. They can be very clingy and materialistic. Some gnomes are said to hoard precious stones and other valuable assets of the earth. This is a bad trait, and a materialistic person might be comparable to one of these gnomes. The Sylph is one of the lesser known mythological beings, but an important one nonetheless. These beings are said to be kind of like a mix between humans and faeries. They are about the size of humans, and look much like them. However, sometimes Sylphs are said to have wings like butterflies and the ability to turn invisible like the air. The Sylphs are a great symbol for opposites, or misunderstandings. While the Sylphs may seem harmless, they could easily fight and take on whoever they needed to. Of course, they could use the air and wind to their advantage as well. Humans might confuse the Sylph as one of their own, or underestimate their true strength. Things are not always as they seem, and Syphs truly symbolize this air element. The undine, otherwise known as ondines, are the Elemental that thrives in water. In most stories, the Undines are usually depicted as being female. They are often mistaken as water nymphs or even mermaids. However, Undines are said to look like humans, but they are said not to have a human soul. Because of this, they are said to be immortal. This symbolizes contradiction in a way. Water element is usually said to be a pure and holy thing, but how can a creature without a soul be holy in any way? Also, mermaids are often said to lure sailors to their deaths, quite the opposite of the purifying power of water. There is no clarity with the Undine like there is with water, only mystery. Even if Undines don’t seem to care for human men, at least they care for the water that any life needs to live. Lastly, we come to the fire elemental, the Salamander. The Salamander is much like the salamanders that roam earth. Except, the Salamander is several feet long instead of several centimeters. The Salamander is usually seen to be on fire, which makes sense since it is the fire elemental. You can only kill the Salamander if its fire is put out, which is no easy task. The Salamander can symbolize power and persistence. It will put up a fight if it needs to, and will do anything it takes to keep its fire from burning out. These fire elementals were deadly, but helpful, as the fire element is extremely useful to humans. Moderation is a good symbol for the Salamander and its fire. A little fire never hurt anyone, but a lot will kill you.